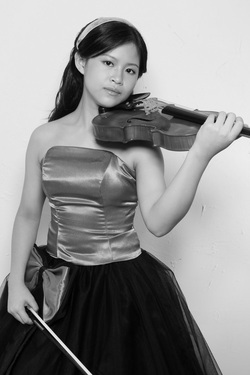 Yu-Ting Chen began her music studies at age three, learning piano, dance, and vocal music in addition to the violin. After studying at the Taipei Culture of Young Children of Music Center from 1999 to 2003, she passed, at age nine, the Violin Performance of soloist (Superlative) Qualification tests of Beijing and Taiwan, both with “Excellent” scores. She studied at the Central Conservatory of Music Junior High School in Beijing, and was accepted in 2010 as a violin student at the Curtis Institute of Music, to study with Ida Kavafian. Yu-Ting has won many important competitions. At age ten, Yu-Ting won 1st prize in violin at the 1st Amadeus Musical Competition by the highest score in stringed music groups. She is also a two-time first prize winner of The National Student Musical Competition of Ministry of Education for violin. In International Music Competition, Yu-Ting took the finals of the 5th Osaka International Music Competition with the youngest age in 2004, won the “Only Supreme Award from Rumania National Broadcasting Station and the Bishop Team of Greek Orthodox Church,” and received honors from the Fifth Asia Future Start Music Competition held by the National University of Singapore. In 2010, she was chosen as a finalist in the Philadelphia Orchestra Greenfield Concerto Competition. She also recently participated in master classes with famous violinists Vadim Repin and Anne-Sophie Mutter. Yu-Ting’s upcoming schedule includes additional international competitions, such as the Moscow International David Oistrakh Violin Competition later this year.